Work computer. A matte screen, good battery life, a comfortable keyboard, maintenance hatches and an unoccupied mSATA slot -- clearly, HP wants to stake their claim on the market for inexpensive office devices. With their 350-G1 line, they may very well have succeeded. The HP 350 G1 is designed for getting work done, both at home and in the office. The device is slender and equipped with a matte display. Two maintenance hatches and a removable battery are also on board. But just how impressive is the 350 G1 when all is said and done? Read our review to find out. 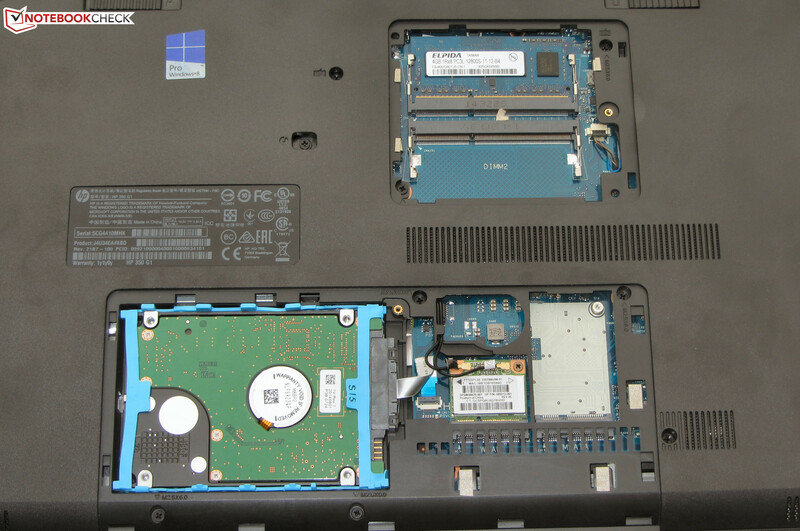 Just recently, we reviewed one of our HP device’s competitors, the Lenovo B50-70 (Core i5-4210U, Radeon R5 M230). Both computers are aimed at the same target audience and are comparably priced. The Acer TravelMate P255-MG (Core i5-4200, Radeon HD 8750M) is a further close competitor. All three notebooks are outfitted with dedicated Radeon graphics cores. The TravelMate offers the model with the strongest performance. The 350 G1's case has the same basic build as almost every current consumer notebook manufacturer by Hewlett Packard. At a thickness of only 23.1 mm (~0.9 inches), the computer is quite slim and easy to carry. In terms of colors, HP selected silver (on the back side of the lid and the palm rest) and black (the rest of the case). Commendable: The 350 G1's surfaces are all matte. The case is comprised mostly of plastic; only the palm rest is made of metal. In general, the computer's physical stability is decent. The case is weak in the usual areas: Below the touchpad, and to the left of the keyboard, the plastic gives under pressure. The base unit is also a little too easy to twist for our taste. The HP 350 G1 is outfitted with two small maintenance hatches. One reveals the working memory, the other the hard drive. Both lids are held in place by a screw. The lid to the hard drive is very difficult to open. Even after taking out the screw, the lid sits so securely in the case that we risked breaking it in removing it. If you own this computer and need to open the hatch, we recommend proceeding with caution. Should the lid break, it's possible to purchase a replacement lid from Hewlett Packard for about 16 Euros (~$19). Behind the maintenance hatch that reveals the hard drive, you will also find the WLAN module and an unoccupied mSATA slot. This feature allows the computer to be upgraded with the addition of a Solid State Drive. However, an added SSD could only be used as cache. We were able to install Windows 8.1 on an mSATA SSD, but the computer refused to boot from the SSD. There are two maintenance hatches. The device has two working memory banks. 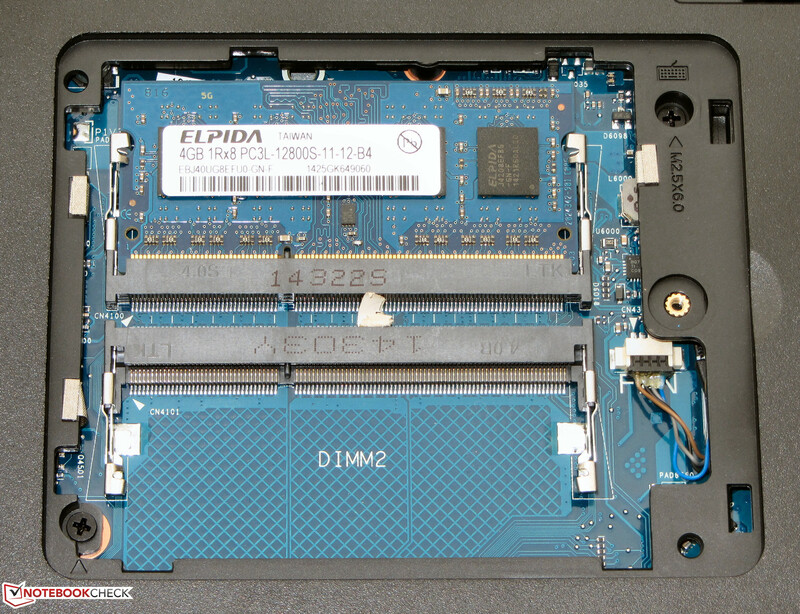 The computer also offers an unoccupied mSATA slot. The HP notebook comes with Windows 7 (64-bit) Professional preinstalled. In the device's packaging, the manufacturer also includes a recovery DVD with a copy of Windows 8.1 (64-bit) Professional, giving the user the option of installing this higher operating system. The 350 G1 offers the usual array of connections, no surprises. A version of this computer with a fingerprint reader is available, though our test device lacks it. The memory card reader is located on the front side of the device. 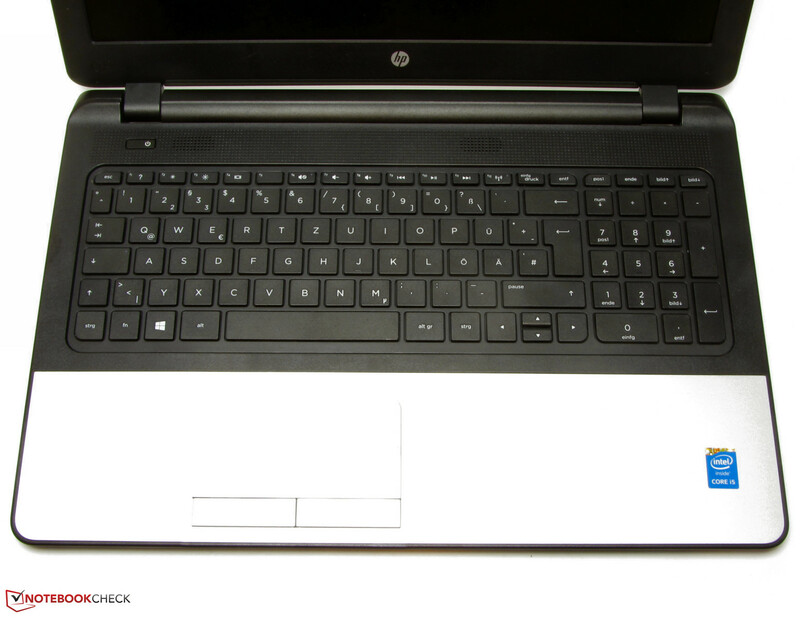 The HP 350 G1 is equipped with an unlit chiclet keyboard. The flat keys have a slightly roughened texture, a short travel length and a clear click point, all of which contribute to the keyboard's smooth feel. The keyboard bends negligibly as you type, but it's not bothersome. Overall, the keyboard offers a good typing experience; it should be possible to type often or for long periods of time on this device. A multitouch-capable touchpad measuring about 10.2 x 5.2 cm (~4 x 2 inches) replaces a mouse. The pad's smooth surface enables your fingers to glide easily across the field. The pad also interprets multitouch commands without a problem. The two mouse keys below the pad have a short travel length and a distinct click point. The 350 G1 possesses a matte, 15.6-inch display with a native resolution of 1366x768 pixels. At 242.7 cd/m², the brightness value is acceptable, but just barely. The contrast (129:1) and black value (1.9 cd/m²), however, are terrible. Numbers like that are no longer adequate in this day and age. The display's color representation isn't much to behold either. Out of the factory, the panel's average DeltaE 2000 deviation is 14.38. In this notebook's price range, usually displays manage deviations between 10 and 12. The ideal number here is less than 3. Additionally, the screen has a visible blue cast. The HP 350 G1 in outdoor use. It's unsurprising that HP installed a TN panel in their 350 G1. TN panels only offer limited viewing angles. Thanks to its matte display, this notebook can be used outdoors. 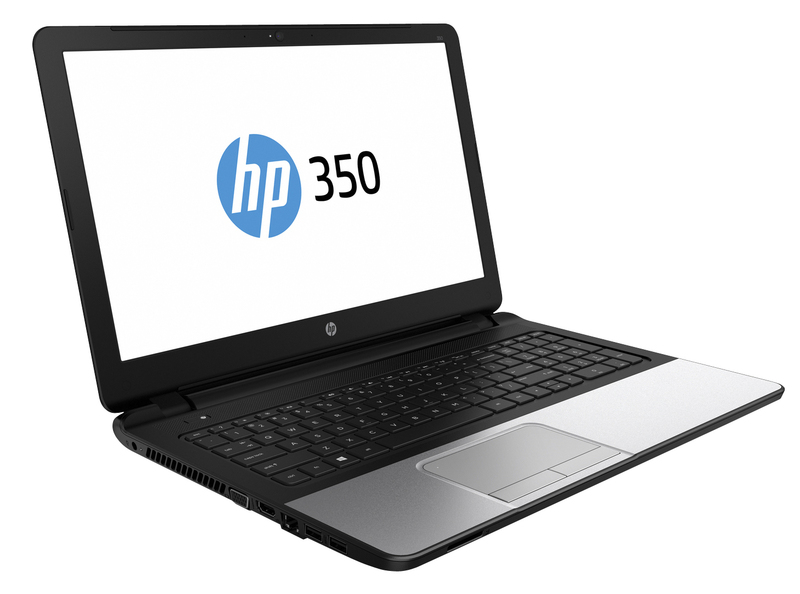 The HP 350 G1 is intended for use as a work notebook for private and office use. For most applications, the computer's performance is more than sufficient. Our test device is currently available for around 600 Euros (~$743). HP also offers a number of versions with different components. The most inexpensive model (K7J00ES) in the series is equipped with a Core i3-4030U processor and costs about 320 Euros (~$396) without an operating system. HP's 355 G1 line is structurally identical and provides an even greater breadth of options. These computers come with AMD APUs. 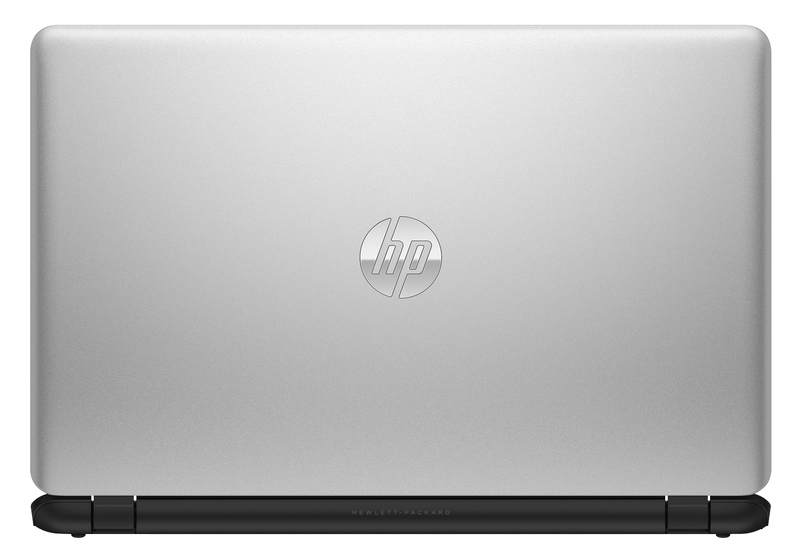 Our 15.6-inch HP device is outfitted with Intel's Core i5-4210U (Haswell) dual-core processor. The CPU runs at a base clock speed of 1.7 GHz. Using turbo, the speed can be increased to 2.4 GHz (both cores) or 2.7 GHz (only one core). Intel's nominal TDP for the processor is 15 Watts. The CPU's full performance is always available, both in AC power mode and battery mode. The system runs robustly and fluidly; we didn't run into any problems. Our subjective impression was corroborated by the system's very good results in the PCMark benchmarks. For their 350 G1, HP selected a Seagate hard drive with a capacity of 750 GB and a speed of 5400 rpm. The transfer rates we recorded are on par with those of other 5400 rpm hard drives and leave no room for criticism. 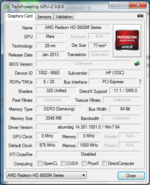 HP chose to equip their 350 G1 with a switchable graphics solution (Enduro), comprised of the notebook's two graphics cores: the Intel HD Graphics 4400 and AMD's Radeon HD 8670M. The two GPUs are intended for different uses: While the computer uses the Intel chip for everyday tasks and in battery mode, the Radeon core is responsible for applications that demand more performance, for instance computer games. The switching happens automatically, but it doesn't work quite as smoothly as the Nvidia counterpart (Optimus). Every once in a while, the user has to help the system by manually selecting which GPU should take over a particular task. AMD's graphics core belongs to the entry-level class of dedicated graphics cards. The card supports DirectX 11.1 and runs at a frequency of 975 MHz. Considering the system's results in the 3D Mark benchmarks, in terms of performance, the core is more or less on par with the GeForce 820M GPU. The HP 350 G1 isn't designed to be a gaming computer, which means its ability to run games doesn't play a particularly significant role here. Nevertheless, the notebook is capable of rendering many games at low resolution and low-to-medium quality settings. Some games are even playable at the panel's native resolution (1366x768 pixels). When it comes to games that demand a lot of performance, like The Evil Within, the computer is generally out of its league. 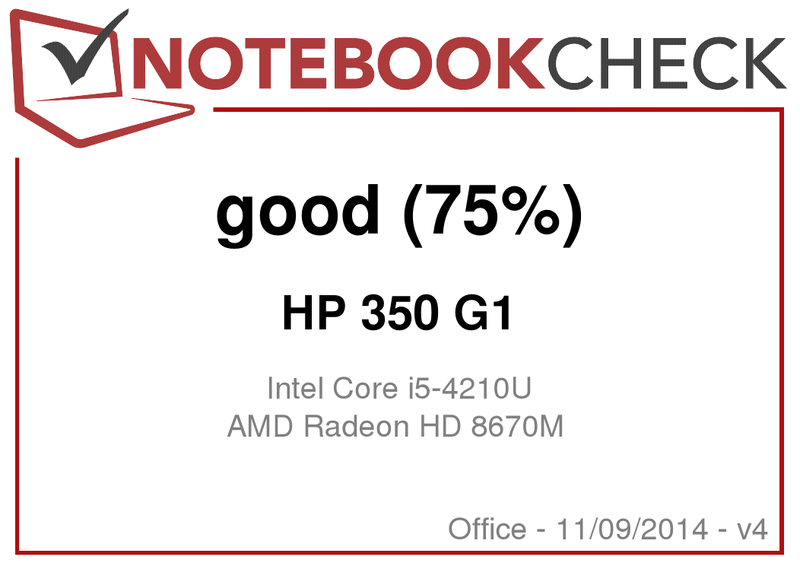 Interestingly, the 350 G1 manages somewhat better frame rates than other notebooks equipped with the Radeon HD 8670M graphics core. We attribute this to the newer drivers and somewhat faster video memory. If you want more gaming performance, it's better to look elsewhere. Possible options include the Dell Latitude 3540 (Core i5-4200U, Radeon HD 8850M; around 720 Euros, ~$891) and the Acer TravelMate P255-MG (Core i5-4200U, Radeon HD 8750M; around 700 Euros, ~$866). Of the two, the Dell computer is outfitted with the stronger graphics core. Stepping out of the "work device for private and office use" category, there are more inexpensive alternatives available. 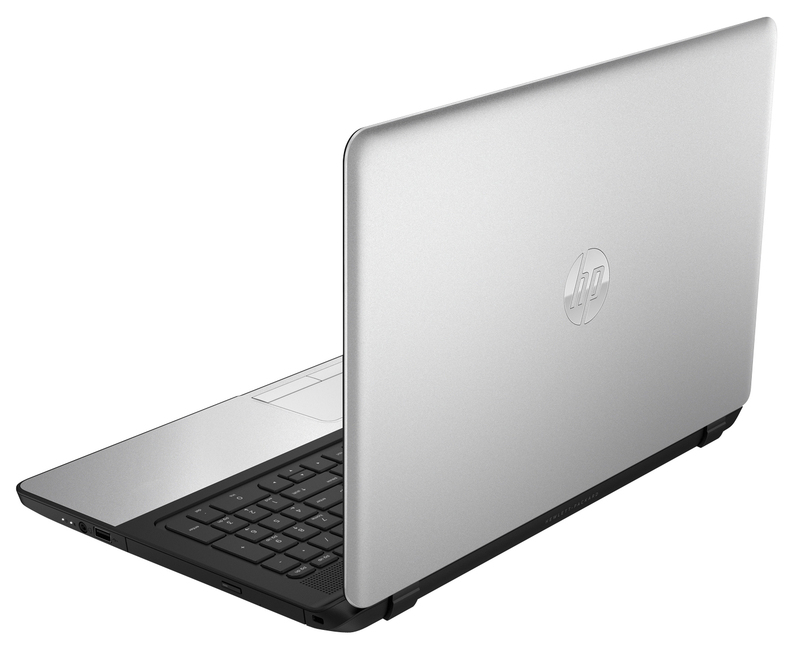 One example is the HP Pavilion 15-p008ng (Core i5-4210U, GeForce 840M, matte Full HD display; around 600 Euros, ~$742). Even in idle mode, the fan constantly runs at an audible speed. As soon as the computer is under load, it gets very loud: We measured a sound pressure level of about 47 dB. Fortunately, however, there is something that can be done about the fan's constant whirring. Most HP notebooks have an option in the BIOS listed as "Fan always on." The option is activated on the HP 350 G1, but it's possible to deactivate it and let the fan sometimes stand still. The HP 350 G1 in the stress test. 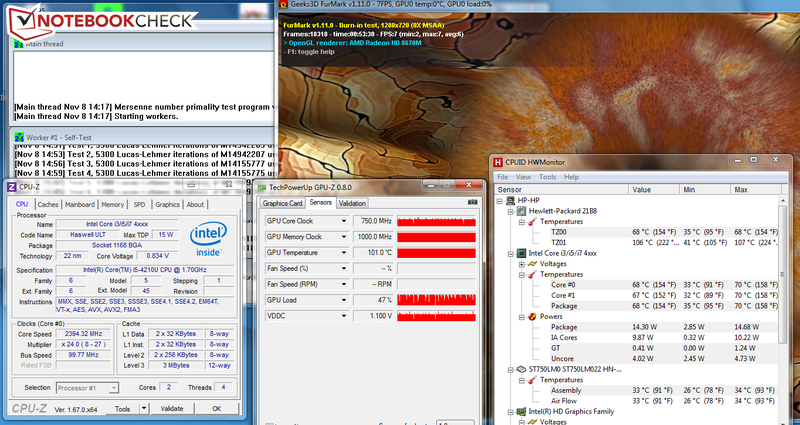 The 350 G1's CPU completed the stress test (Prime95 and Furmark running simultaneously for at least an hour) at 2.4 GHz in both AC power mode and battery mode. While the graphics core ran the stress test at 600 to 975 MHz in AC power mode, in battery mode it throttled down to 400 MHz. Even during the stress test in AC power mode, the case only warmed up minimally. We measured temperatures of much less than 40 °C (104 °F) on every area of the case. The extremely high fan speed during the stress test made a positive impact in this discipline. The HP computer's stereo speakers are located above the keyboard, underneath a perforated covering. They produce a clear sound, though the lack of bass is definitely noticeable. With the preinstalled DTS software, it's possible to adjust the sound to your personal preferences. Alternatively, you can plug headphones or external speakers into the notebook's 3.5 mm jack. When it comes to energy consumption, the 350 G1 proves not to be particularly greedy. In idle mode, the computer's energy use lies in the usual range for Haswell notebooks (less than 10 Watts). During the stress test, the device's power consumption fluctuates. This is tied to the fact that the graphics core doesn't run at a constant speed. The peak energy consumption rate reaches up to 46.1 Watts. In light of the notebook's hardware, this is a normal number. In our WLAN test, which is designed to simulate practical, everyday use, we use a script to automatically load a new webpage every 40 seconds. The energy-saving profile is active, and the display brightness is set to about 150 cd/m². The HP 350 G1 manages a battery runtime of 5:01 h -- a good result. Its competitors, for instance the Lenovo B50-70 (3:15 h) and the TravelMate P255-MG (3:30 h), peter out considerably earlier. Overall, the HP 350 G1 makes a good impression with its respectable application performance. A reasonably long battery life and comfortable keyboard add to the device's desirability. The computer barely warms up at all, and it offers an unoccupied mSATA slot. Unfortunately, the 350 G1 can't boot off the drive, which means a Solid State Drive can only be used as cache. The matte screen's brightness level is acceptable, but its contrast, black value and color display definitely leave something to be desired. Unfortunately, HP -- like Lenovo with their B50-70 -- only offers a one-year warranty. At 600 Euros (~$742), a two-year warranty should be a matter of course. 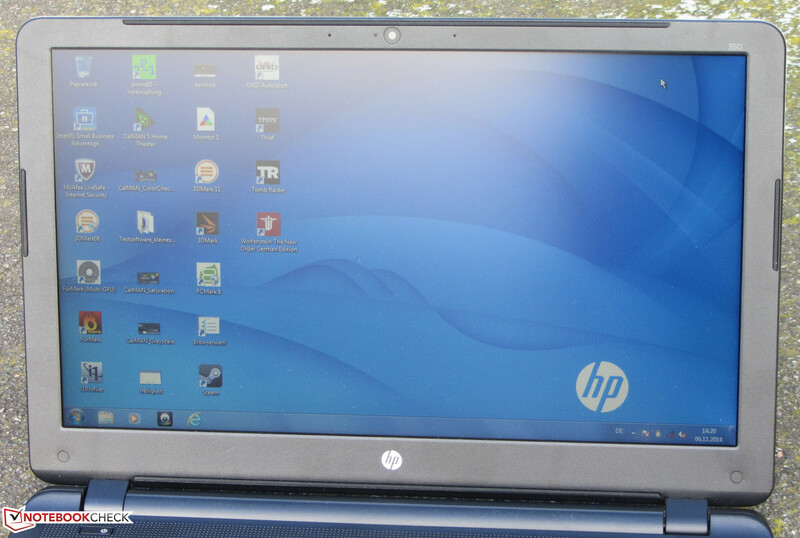 In review: HP 350 G1 (J4U34EA). Test model courtesy of: HP store. The battery life, the keyboard, the cool temperatures, the unoccupied mSATA slot. A higher-contrast display and a longer warranty period. Just a twelve-month warranty for a 600-Euro (~$742) computer -- that's too short. Lenovo B50-70, Acer TravelMate P255-MG, Fujitsu Lifebook A544, HP Pavilion 15-p008ng, Acer Aspire E5-551G, Dell Latitude 3540, HP ProBook 450, HP ProBook 455.